Why Are They Called EXcelerator Search Coils? To Excel : To surpass others or be superior in some respect or area; do extremely well. To Excelerate : To go faster, at top speed to reach your goal. Some call them excellent, others just call them fast and accurate, but no matter how you refer to them, one truth remains : EXcelerator search coils produce outstanding results. These world renowned search coils go above and beyond any after-market search coil in the industry today! Kellyco PROUDLY provides these exceptional search coils to our White's, Minelab, Garrett, Fisher, and Teknetics metal detector users. We are confident that they will provide the best performance for your metal detector! Why Should You Purchase an EXcelerator Search Coil for Your Metal Detector? Excelerator Search Coils are Made to go Deeper Than Factory Coils!! The search coil that comes standard with most metal detectors are ones that manufacturers feel give the best all-around results. However, both larger and smaller sized search coils are necessary to get the best performance from your metal detector, not to mention making sure you leave no treasure unfounded! EXcelerator search coils are world-renowned for their depth and maneuverability. Small, medium or large, any EXcelerator coil you add to your metal detecting arsenal is almost guaranteed to show you treasures at unheard of depths or in places you never thought you could detect! Great for Finding Gold Items! When Will You Require a Larger Search Coil? It's happened to us all at least once - you're detecting and finding lots of good targets like U.S. Civil War bullets or wheat pennies from the turn of the century. After a while the amount of hits becomes less frequent and the audio signals from your detector become weak; letting you know that your search coil has reached its maximum detection limits. But you KNOW there are still deeper, more valuable targets in the ground. With an EXcelerator search coil you don't have to leave those valuable, deeply buried targets to be found by someone else! 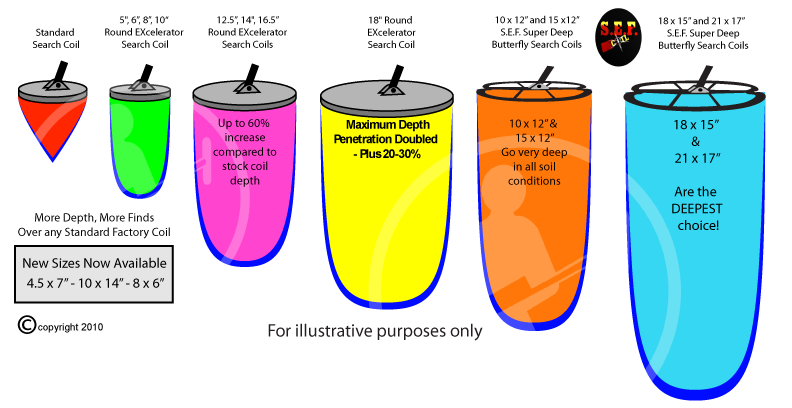 Kellyco's 14" EXcelerator search coil's maximum detection limits can be as deep as 15 or 20"! One of our more powerful EXcelerator search coils is the 18", which can penetrate to depths of 20 or 26" and locate a single coin! It can go even deeper than 26" for caches and other small or large treasures that other detectors and average search coils simply cannot reach! By using larger EXcelerator search coils, such as the round 12.5", 14" or 18", you will be able to detect deeper; find older targets; and even search a wider area in less time! To go even deeper to find the more valuable old coins, relics and other treasure including gold nuggets, use EXcelerator SEF Butterfly 15x12", 18x15" and 21x17" coils. All SEF Butterfly search coils have an unusual blunted shape to the front and back of each coil resulting in greater depth and a wider searching scan letting you cover more ground in less time resulting in more "finds". What does an EXcelerator SEF Coil do? It creates a Symmetrical Electromagnetic Field uniquely combining both DD (Double D) and Concentric detection signals resulting in your detector getting the best sensitivity of both types plus greater depth! When Will You Require a Smaller Search Coil? By using smaller EXcelerator coils, such as the 5"DD, 6"DD and 8"DD, you will be able to search for older, more valuable coins in "hunted out" areas. Smaller EXcelerator search coils are extremely selective in heavily trashed areas where its size can see coins below trash; even when surrounded and covered up by junk items! 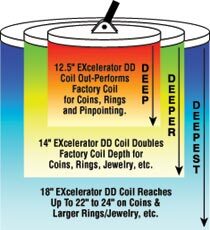 Kellyco's 5" EXcelerator search coil is perfect for finding thin necklaces and bracelets that are virtually impossible for other detectors and larger coils to locate - jewelry is where the smaller EXcelerator coils prove their value. Whether gold or silver, rings are no match for these dynamic, DD search coils! Most users realize that one valuable ring find will easily pay for their entire metal detector purchase. Regardless of your metal detecting preference - coins, rings, jewelry, relics, artifacts, caches, small and large treasures as well as gold nuggets - all can be found with detectors using EXcelerator search coils! Larger Gold Nuggets and Other Deep Treasures in the Ground! The ULTIMATE coil is a new generation DD coil. Compared with the classic DD coils it has the following advantages:ribbed housing, specially designed for absorbing the mechanical shocks and vibrations, made of special polymer, strengthened with glass fibers, with maximum UV protection - more stable operation - better sensitivity - better pinpoint - more accurate target identification - more stable ground and better overall field performance. The coil keeps its perfect inductive balance in a very wide temperature range. This coil is light for it's size. It weighs approximately 480g. Comment From Test Report : "My impression of the 10x12" SEF coils on both machines was that that they did provide the additional detection depth needed to reach targets just beyond the reach of the stock coils and that the response to these targets was more discernible even when I knew there was a target present." Comment From Test Report : "These experiences showed that the smaller EXcelerator coils provided better separation in high trash than the stock coil with better-than-expected detection depth." Round shape, Elliptical, open and closed EXcelerator DD, Concentric, EQ2, EQ2Pro, all these coils are Unique and Amazing Search coils that can dramatically make your ordinary metal detector into a more powerful, deeper seeking detector that will be able to find deeper more valuable targets . You really do NOT know what you're missing right now. Buy a coil, any size, then go back over all the ground you covered with your present detector coil and be shocked to see all the coins and other treasures you missed, and think of how much more you will find with your new EXcelerator search coil. Go Deeper and Find More Valuable Targets! EXcelerator Search Coils Really Pay Off! This is my second detector from your company that I have purchased and I have also purchased supplies in the past. I appreciate your service.